The God Delusion is Richard Dawkins’ latest and most famous book. It has made him a hero of atheists and the Skeptic Movement and one of the most hated men on Earth, mostly among the Christians of the United States. I read it because I like hearing both sides of the story; I hoped it would give me insight, change my mind where changing it was necessary and not leave me confused. For the most part it has done all those things. But it wasn’t what I expected. I got right through the introduction and first chapter without reading anything I seriously disagreed with. I can’t bring myself to dislike Dawkins and nobody can question his benevolent will, however wrong he might be. Something else on the plus side: Dawkins is a very skilled writer with a developed style that I, as a fellow writer, can admire. He’s very witty, much funnier in print than he is live. He uses perceptive metaphors and similes and has a biting sarcasm. One thing that disappointed me was that TGD’s scope was far smaller than I anticipated. Dawkins begins the book with his own declaration as a rationalist and atheist. I was then poised for several chapters of a Ken Wilber-style metaphysical argument about how the Western rationalist cognitive suite is far better than any other cognitive suite, but alas no. Dawkins pole-vaults over the entire issue and continues the book with the unspoken premise that this argument has already been decided and that the Western rationalist cognitive suite has prevailed. This is why throughout my reading of TGD, I felt that it was primarily a book aimed at other Western rationalists, and those religious believers who are Western monotheists and embrace binary Western logic. In this sense, it is not a book that questions or criticizes religion at all, just certain types of religion (But to be fair, one could perhaps argue that this is OK for practical reasons because the Western monotheistic establishment is the most politically and socially powerful in today’s world, with disastrous consequences). I felt a bit left out; as if Dawkins and I are on different wavelengths. Reading the book has inspired me to invent a new word: “Rationalocentralism”. His chapter titles like The God Hypothesis and Why There is Almost Certainly No God are phrases with little meaning for me. For me, God is not an object, or anything that can be hypothesized or disproved; if it was then if He didn’t exist I’d have been able to work it out by now, and if He does, who He actually is! Dawkins would no doubt interpret my views as what he calls “NOMA” (Non-Overlapping MAgesteria), but again this would not be fair because God is not something that can be separated into another “magisterium” from something else. Actually I don’t think at any time in the book Dawkins gives a satisfactory definition of what he means by his book’s pivotal subject matter: “God”. He lumps his promotion of materialism into the same basket as his criticism of Western theism without understanding that the demolition of Western theism doesn’t equal materialism’s triumph. I therefore found it hard to get inside the author’s head and understand his points. (I’ve never spoken to Dawkins, although I’ve seen him a couple of times; but if I did speak to him then a conversation might be very frustrating for both parties!) TGD actually provides little new information for anyone experienced in the God/no God debate. A lot of the issues he discusses go back centuries, and his sources are often thinkers from long ago. Dawkins would not feel out of place at the “soapy Sam” debate in Oxford more than 150 years ago. This is not really a criticism though; the book could be described as a comprehensive summary of the issue which every subject needs and may well have been lacking beforehand. There were some occasions when Dawkins’ attitude disturbed me and hearkened back to Rod Liddle’s The Trouble with Atheism. (Liddle’s review is quoted on the back cover: “entertaining, wildly informative, splendidly written. We are elegantly cajoled, cleverly harangued into shedding ourselves of this superstitious nonsense…” Has Dawkins made a convert here!?) 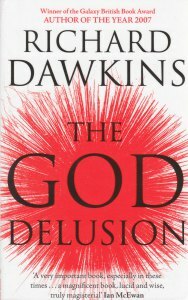 For instance there’s a chapter called The Poverty of Agnosticism in which Dawkins quotes an atheist and religious believer making almost identical pejorative remarks about agnostics, running along the lines that both men admired people who’d made up their mind and were certain but poured emasculating scorn on those who were shilly-shallying about in between. (This, by the way, is one of the reasons why I think rationalism and Western theism have far more in common than they do in difference and are candidates for what David Icke calls “opposames”; I’ll return to that point later). What concerned me was that Dawkins rather endorsed them! He failed to declare any fault with their views. This is a clear mark of something profoundly cultural in the book and Western thought in general: the worship of certainty. Things either are or are not; it’s yes or no, black or white. We need certainty, we strive towards it and we work desperately mop up the areas where it is lacking. This kind of binary logic is a central structure of both Western theism and rationalism, as the two quotes show. To fail to worship certainty, to resist the urge to be fixated on it, is perceived as a sign of weakness. Those who do so are treated like conshies in World War One! This for me is very juvenile, judgmental and narrow-minded; and it pains me to see Dawkins handing out the white feathers. The world will never be certain. The clockwork of Newton’s model is disintegrating into a new model of fractal chaos and quantum superposition. The rationalists who want to find as much certainty as the model allows can go ahead, but they’ve no right to urinate on those who choose not to jump on their bandwagon. I don’t see anything weak about living without certainty; there are many other cultures where certainty is almost an unknown concept and even anathema, but most of those have been swamped by European and North American consumerism and their voices are lost in the din of ring-tones and IPods. “What is the sound of one hand clapping?” “What does a tree sound like if it falls down when nobody is there to hear it?” Well, let me tell you, Richard Dawkins that I am one Westerner who will not be bullied into the recruiting office! Dawkins also has something of a contempt for theology. This is clear from a quote on page 79 where he says: “If (something) lies beyond the province of science then it almost certainly lies beyond the province of theology. I am tempted to go further and wonder in what possible sense theologians can be said to have a province.” He then quotes a warden at his college who doubted whether theology was even a subject at all. The snootiness of this position repels me. It matters not to Dawkins that theology is merely the study of religious belief; in fact some theologians are atheists. Dawkins, on the same page, says that philosophers would be insulted that somebody equated theologians with them. But as I said above, Dawkins has little time for philosophy either, so how can he even make an informed judgment? I’m very wary of anyone with a disdain for philosophy and theology because it suggests that all the answers have been sorted out… by themselves! Dawkins lays into philosophy later in the book on page 319 where he deals with what he sees as the “science is a religion” fallacy. He says that “amateur philosophers” (Pot and kettle! And at least amateur philosophers philosophize which is more than can be said for Dawkins!) say that to disbelieve in a God is a religious statement and that belief in rationalism is an identical fundamentalist belief. Dawkins refutes this by saying that he’s only a fundamentalist when it comes to the empirical truth, and the example he gives is that New Zealand lies south of the equator. But then if he had a deeply powerful mystical experience (of the type I’ll go into in more detail later) which was so real, but impossible to prove as these experiences almost invariably are, that every fibre of his being screamed at him that it was real; would he accept it? If his response was to swim upstream against his intuition and reject it because of its inherent improvable nature, then he is a fundamentalist. He is no different to the geologist he quotes, Kurt Wise, a man who decided that the world was only 5000 years old against all evidence because the bible said it was. Conversely I refer the reader to the scene in the film Contact where Jodie Foster’s character refuses to denounce her mystical experience even though she cannot prove it; she is therefore not a fundamentalist. The reaction of the hypothetical rationalist’s peers is another factor. How would they respond to their colleague refusing to reject his experience? With understanding and expectance, seeing as they are definitely not fundamentalists and very different to these religious bigots? How would they? We can ask how do they. How did they treat Timothy Leary, John Anthony West, Wilhelm Reich? There are many examples of scientists who’ve stepped out of line and been treated in exactly the same way as religious apostates are; sometimes even the word “heresy” is used. Rationalistic, scientific atheism may see itself as immune from religious-type behavior and lily-white in its conduct, but it’s not; and that’s a bubble that needs bursting. The dichotomy between the material and ethereal is not a universal law, but merely a cultural fad. Nobody can dispute that the ancient Egyptians were full-blown rationalists and materialists with a mental aptitude to take the real world head-on. They produced some of the finest engineering and scientific feats in history, but their language had a single word that translates both “astrology” and “astronomy”. Let me say that again: They had one word that meant two things which in modern Western culture are perfectly distinctive; some might even argue that they are contradictions, and that you can be one or the other but not both! But in ancient Egypt they meant the same thing. In fact if you tried to explain the difference between astronomy and astrology to an ancient Egyptian you’d have trouble making them understand! In their culture there was no contradiction between mystical belief and exact scientific knowledge. Dawkins’ view of science would be almost endearingly naïve if it wasn’t so misleading to the reader. There’s no doubt that science is an essential part of human activity and it’s achieved many great things, but the image of science presented in the book is of a pure, united front of intelligent, impeccably professional, compassionate oracles of wisdom. This is not what science is. Science has a dark side. This dark side is a child’s playpen of controversy, infighting, politics, dogma, infantile rage and oppression. An acknowledgement of this dark side is very manifestly absent from TGD. Dawkins does occasionally let it slip that all is not well at the mill, but I only counted two occasions. In one Dawkins has just described an incident when he witnessed a scientific ideal. A visiting lecturer had just proved wrong the pet theory of one of his tutors. At the end the tutor walked onto the stage, shook the man’s hand and thanked him for it to a rapturous applause. Dawkins admitted that “in practice” this doesn’t always happen. Yes? Go on, Richard. I mentally said, but was met with a change of subject. He also says that “Most scientists are monists and not dualists” (My emphasis. A monist is someone who believes that the mind is a product of brain activity whereas a dualist thinks the mind is separate from the brain). What? Not all of them are monists? Why not when you’ve presented the issue as such an open-and-shut case? But again, the author fails to elaborate. So when he then claims on page 320: “(Science) believe(s) in evolution because the evidence supports it, and we would abandon it overnight if evidence arose to disprove it”, you’ll realize that I very much doubt that. It would instead be abandoned after a number of decades when so many of the old guard had retired that there were no longer the personnel to man their witch-hunts against the pioneers of the new paradigm, enabling them to work in peace. Then would come the declaration from the pages of the peer-reviews: “Ah, we thought it was that all along”! In one instance he refers to the Templeton Foundation’s prayer study, a proper scientific trial to see if praying for someone who’s ill makes them better. Dawkins is unequivocal: The study showed that praying has no effect at all. However there are other sources which claim that more than one study was done and that the net result was that they did show some sign of working (Fenwick 2005). What is true? Who do we believe? And if there is any controversy or doubt on the subject why doesn’t Dawkins tell us in the book? Why, in the same way, when Dawkins quotes the “rabbits in PreCambrian” cliché, does he not mention the confusion over the discovery of anomalous fossils (Cremo-Thompson 1996)? “It’s OK; if evidence turns up we'll all change our mind…” Pull the other one, Dicky! In actual fact, the author has probably heard of some or even all of these controversies and probably dismissed the alternative conclusions, but this is not a reason to omit them from the book. The book is aimed at laymen and newcomers and it’s giving them a false impression of the scientific world. One thing that did impress me was that Dawkins, unlike most of his fellow Skeptics, makes an effort to resist the temptation to join in with the group-masturbatathon called MBA (For an explanation of MBA, see here: http://hpanwo.blogspot.com/2008/01/chris-french-mba-gold.html) However when he goes into the realm of “personal ‘experience’” (Why does put “experience” in quotes?) he still repeats the establishment line that all occasions where somebody thinks they’ve had, what I’ll call for arguments sake, Divine Encounters, they are simply having hallucinations, something like a very pleasant acid trip, bolstered by the MBA’s wishful-thinking; the same goes for the “imaginary friend” phenomenon in childhood. The main reason for this is that there have been successful experiments in which altered states of consciousness (ASC's) can be artificially induced with drugs, electrical stimulation of the brain’s temporal lobes, by hypoxia of the brain and sleep deprivation or exhaustion, Shamanic trance dances for instance, or from trips in high-G flight simulators. Dawkins goes further to site examples of even more mundane causal sources for ASC-based delusions, like the cry of a particular seagull! Firstly, the fact that we can artificially create ASC's doesn't mean that they're not real, anymore than manually turning a radio dial to another station means that the other station is not real, just a product of your hand! Secondly I think that very powerful mystical experiences, the Divine Encounters I mentioned, are a different phenomenon from other hallucinations altogether. This is not just because of context: EG: "I saw an angel standing at the side of my deathbed" making the vision more significant because it was seen at your deathbed rather than if you just passed an angel in the street on your way to Tescos. No, it sounds like Divine Encounters have a distinct qualitative difference to other forums of ASC's. Although I've never experienced any form of ASC, except a very mild mushroom trip, so I'll have to wait and see if I do to be sure! But I know enough about this subject to disagree with the official stance reproduced in the book. But Dawkins’ breach of the subject gave me an insight during his brief indulgence with MBA when he discusses religious “memes”. “Meme” is a word I thought was invented by Dawkins, but apparently it’s not; he just likes to use it. It means an idea that behaves just like genes, in that it is passed from generation to generation, evolving and mutating along the way. He asks where the meme for religion came from and it brings him onto the subject of Life-after-death (LAD). According to him, the attraction in the supposed myth that our mind is not destroyed when our body dies but continues in another form was one of the sources of the God meme. I’ve written about this subject a lot before and I disagree with that. After reading Dawkins’ explanation of memes, “memeplexes” and how they work, I ask myself why the MBA meme didn’t win out over the LAD meme. It’s too big a subject to go into here, but I’ve said before why I think that the MBA meme is far more attractive and therefore more survivable than the LAD meme. It’s the greatest irony that when it comes to ASC’s and Divine Encounters, organized religion and rationalist science stand side by side. They will unite in condemnation of the idea and anyone who professes it. This is why I say again and again that I don’t see organized religion and conventional science as opposites. I see them together on one side, with other forms of spirituality on the real opposite side. I bring this point up again when Dawkins gets onto the subject of suicide bombers. He laments that if it wasn’t for belief in LAD and the promise of a “martyrs’ heaven” then these madmen would not carry out these barbaric acts. Well how come then that communists in the Middle East, as well as in Vietnam and elsewhere, employed suicide bombing? These are people following the same philosophy on LAD that Dawkins does! He’s obviously never watched Cult of the Suicide Bomber. TGD goes into detail about the stupidity of the bible, its contradictions and dubious morality. Dawkins provides a solid argument to oppose the idea that the bible is a source of good moral conduct. For a change I’m in agreement with him. He rightly and cleverly observes that the God of the Old Testament is the most unpleasant character ever created in all of fiction: racist, male chauvinist, petty, violently jealous, grudge-bearing, and outright genocidal! That’s because the God of the Old Testament is just that, a fictional character; He doesn’t exist. But how Dawkins crowbars this into his conclusion of the total non-existence of any God escapes me. Once again, I feel I’m on a different wavelength. Nevertheless, suppose we all became Dawkinsian Skeptic/atheists tomorrow; would the world be a better place? Well, I have to admit that it probably would be a great improvement, but would it be a paradise? Definitely not. I’ve already stated how atheists are capable of the same kind of damaging behavior as religious believers. And as I’ve said elsewhere, we’re living in a world where a person can be abused, ostracized and threatened with violence for saying that they're proud to be a Hospital Porter; does anyone really think that in the New Global Atheist Skeptical Republic people who want to believe in supernatural or spiritual powers will be allowed to go merrily on their way? Dawkins actually doesn’t say this in as many words, but he does imply it. Once again, he’s definitely got his rose-tinted glasses on! When it comes to agreeing with Dawkins I’m 100% behind him over faith-based schools and religious indoctrination of children. A big regret of mine is that I sent my own daughter to a Catholic primary school. I didn’t have the excuse of being brainwashed either as I was already three quarters of the way though my own lapsing process at the time. As it turned out, my daughter was not affected and today she’s more of a Skeppie than I am! (I did take her to Mass a few years ago because she asked me to do so, but she lost interest after a while. I still feel guilty over having her baptized as a baby, but none of us are perfect parents and all’s well that ends well.) But I do seriously challenge Dawkins over his view that even moderate religion provides an environment where extremism can flourish. This may be true in some cases, but it can’t possibly be universal; if it was that would mean that the Sufi orders provide a source for suicide-bombing Jihadists! That’s ludicrous! The Sufis are less likely to inspire suicide bombers than Dawkins himself! The Sufi order, the Cathars and many other Gnostic sects also contradict Dawkins’ view that all religion discourages questioning and analytical thought. Again, his book’s narrow scope prevents us from getting a true understanding of the situation. I also wonder where Dawkins gets his information on historical figures when he “outs” certain people like Isaac Newton and Mahatma Gandhi as atheists. Both of those people were in fact believers in mystical or religious forces of one kind or another. Perhaps it’s so oxymoronic in Dawkins’ view of the world that a person can be a great and innovative physicist, or a dedicated humanistic and secular political freedom-fighter, and yet still be in some way spiritual and mystical, that he’s gone into denial. Maybe this is why the last chapter takes the format it does: Dawkins ends the book by declaring that if you don’t have a belief in a God you can replace it with something else to give you inspiration and meaning in your life. In his case it is of course science. He goes onto a lengthy narrative on the wonders and joys of scientific investigation, the workings of the Cosmos, the miracle of life etc. It taught me a thing or two! Dawkins explains how bats can “hear” in colour and dogs can “smell” in colour! This is because those senses are so much better then their human equivalent that the part of our brain that lets humans see colour is adapted to those other senses in those other animals. As I read this section I realized that for the first time I understood where Dawkins was coming from. I feel that same wonder over the glories of the universe; but is it really necessary to reject belief in God to appreciate that? At the start of the book Dawkins says that if any of the book’s readers are religious then he hopes they will be atheists when they put it down. So he makes no bones about it; he is trying to win converts. As I said above, I still don’t understand, after carefully reading the whole book, where exactly I fit into it. My own spiritual beliefs are indefinable, but they’re certainly real. I’m not an agnostic in that respect. So I don’t feel I really fit into anything Dawkins says about religious belief. I’ve been called an atheist by a few people, and by some definitions of the word I certainly am. But I’m not anything like the atheism and atheists Dawkins discusses. I would never refer to myself as an atheist. So I still felt a bit like a distant observer of the book’s “rationalocentric” scope, and therefore its theme, rather than a participator. One thing’s for sure though: the book has had a reverse effect on me than the one Dawkins wanted. If anything I’m less of an atheist when I put it down than I was before I picked it up! Part of the modern banking system involves the familiar magnetic strip on the back of credit cards and the strange-shaped numbers at the bottom of cheques. Both are designed so that a computer can read them and the cheque font is the direct precursor to the all-too-familiar barcode. These were invented in the 1950’s; the magnetic strip originally being placed on cheques before the credit card was introduced. No patent was ever claimed on them, but in 1972 a strange court case began over the cheque font and magnetic strip. A man named Richard Williams was suing the international banking system for infringement of copyright. He was claiming over 20 billion pounds in lost royalties, 2 pence for every cheque ever deposited since the font and strip was introduced. The reason: He’d invented them! The case was doomed to failure, but it gave some publicity to a remarkable man who a few years earlier had given the Banks of England many sleepless nights when he began circulating perfectly legal Welsh banknotes. Richard Williams was born in 1915 and lived his whole life in North Wales. He started out as a bank clerk in Midland Bank (now HSBC) in Llanrwst. Then he became fascinated with computers and wrote a book in 1955 called The Electronic Office which foresaw many of the communications technologies we’re familiar with today. One of the things he predicted was the use of computer readable numbers and security using coded information stored on magnetic strips. He built working prototypes and demonstrated them to banking directors from all over the world at conferences. He was unfortunately left in the wake of bigger and more powerful organizations willing to exploit his technology, but in his later years he came up with a scheme to get his own back; which inspired many patriotic Welshmen and gave us an idea that lit up the whole fallacy of the modern financial system. He printed an independent currency beginning in 1969: the Welsh Pound. Eventually the notes ceased when Williams began concentrating on his copyright case, but the moral of this long story is that Williams was demonstrating an important principle: Money is not something physical that can be owned, it in merely a measure or scale to declare the value of something within the financial system. We don’t have to use the usual scale, your nation’s currency, if you don’t want to. If you choose to employ a separate currency there’s no reason why you shouldn’t, so long as all the people in the shops etc that you use accept it too. Like so much in life it’s simply a choice. We think we don’t have this choice because we don’t question the common fallacy that money has inherent value. This fact was lost on the deluded Iraqis who broke into the banks and stole all the money after the fall of Saddam. They really thought they were taking something of value when in fact the currency they were stealing was no longer legal tender under the new regime. They raided a bank to steal useless bits of paper! The success of the Welsh Pound came not from the fact that it had been approved by being taxed, but by the fact that with this approval people took it seriously and began using it. If people had understood the principle and decided to use it even without its license then it would still have been a success. What Williams can do, we all can do. Just one eccentric Welsh businessman, starting a small currency in a small local area almost brought the Bank of England to its knees. Imagine if we all started doing it! 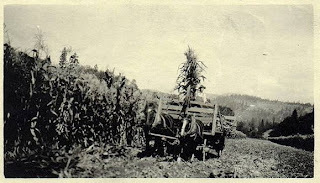 It’s a little known part of history that in response to the stock market crash of 1929, many American towns started their own local economies. The one in Ithaca, New York is running to this day. It has a currency called the Ithaca Hour, because each one represents payment for an averagely-paid person’s single hour of work. The local banks will let you deposit it and it’s causing a terrible headache for the Federal Reserve (Bank of England US branch!) not least because they can’t find a way to tax it. But what they’re really scared of is that the idea will catch on! Well the thrust of this article is to make the idea catch on. Up yours, Allan Greenspan! 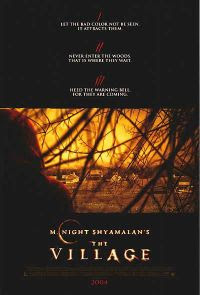 The Village is a most remarkable film from a very proficient director, M Night Shyamalan; it's my favourite of all his works. It is set in the 19th Century in a small isolated village in the middle of a thick forest. The people there live the life of simple Ye Olde Worlde farmers, completely self-sufficient. They’d have little need to visit the outside world… even if they could. The people are in fact trapped in their village, trapped by two things: The village elders, who founded the community twenty or so years before the setting, did so as a refuge from the outside world. All of them have lost loved ones to violent crime and tell their children that in the outside world, which they refer to mystically as “the Towns”, all people are evil and must be left well alone. The village-born generation revere their elders and accept their word as Gospel; in fact when one of the young villagers eventually meets somebody from the Towns she says: “You have a kind voice. I hadn’t expected that.” And there’s another problem: the forest surrounding their idyll is the domain of monsters known simply as “Those-we-do-not-speak-of”. These monsters are vicious man-eaters, but are intelligent and have struck a deal with the village elders. They’ve granted the villagers a small piece of territory in exchange for a tribute of some of the farm produce, which is left just beyond the boundary in a sacrificial-type ceremony, and the promise that no villagers will enter their woods, which is another reason why the people can never leave the village. The remaining section of this article contains spoilers so I recommend that you watch the film before reading on. Like Shyamalan’s other film, The Sixth Sense, The Village ends with an explosive twist: The movie is not really set in the 19th Century, but in the present day. It is built on a sealed-off wildlife reservation owned by Edward Walker, one of the elders played by William Hurt. It is reveled that he managed to arrange a no-fly zone over the reservation to prevent passing aircraft from spoiling the illusion. The whole situation is divulged when one of the villagers is critically injured and Walker’s village-born daughter, Ivy, played by Bryce Dallas Howard has to visit the Towns to collect medicine for the sick man. Walker also lets her in on the secret that the monsters are not real either! The elders made them up to stop the curious village youth from straying out into the world. They even go as far as to occasionally dress up in monster costumes and let the villagers see them! The elders are all convinced that they are doing the right thing and that their actions are justified to preserve their community and protect their kin from the evils that lie beyond it. For me, The Village is a parable for the whole world and the human condition. We are trapped like they are, on our planet and our 3D-linear time plain. We are kept in our little illusory Umwelt in the same way as the villagers, through deliberately-engineered ignorance and fear. The elders are an allegory of the Illuminati, people who know the truth and keep it from us to control us. Like the elders, some of those in the lower degrees of initiation are truly motivated by kindness. They believe that it is necessary to keep us in this box for our own good. I don’t agree at all and I think that this rear-echelon of the Illuminati is in turn manipulated by the higher degrees who have a totally different objective: The creation of the New World Order. They control us not for our interests, but for theirs. Like Ivy in the film, we can escape. She signifies the emerging spirit of human freedom that is rising in society today. Named after a plant that can climb walls, she climbed over the fence surrounding the sanitized enclosure and into the world beyond. We too can climb the fence to freedom if we reject the control that keeps us in our Umwelt. We’re seeing more and more films on this recurring theme: Someone lives in a fake world without knowing it; they discover that their world is really a sham and then escape into the real world. This is the plot behind The Matrix, Dark City and The Truman Show which I’ve written about before. It’s encouraging that mainstream cinema is coming out with stories like this. Gary McKinnon has been described as a “hacker” but this is a misnomer. He is simply an ordinary Internet surfer with basic computer skills and no IT qualifications. After watching the Disclosure Project press conference in 2001 (see links) he decided to browse through the United States Department of Defence to see what they had on UFO’s and suppressed Free Energy. No great surprise, there was nothing obviously declassified. But all Gary had to do was search a little deeper and he came across some extremely highly classified documents relating to UFO’s. To his amazement these files weren’t on secure servers! They weren’t even password-protected! They were there on the net for anyone to see! All he had to do was register on the Pentagon system and he was granted administrator’s privileges! Whoever they've got hosting the Pentagon website they've obviously been selected more for other qualities, like keeping their mouths shut, than their IT skills! He then went on to view some very sensitive information including a close-up photo of a UFO taken in space, the kind NASA cuts out of the Space Shuttle mission footage, and a list of military personnel under the enigmatic title of “non-terrestrial officers”. 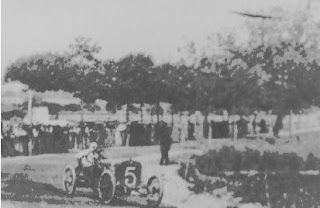 It included names, ranks and service numbers. What this means is anyone’s guess, but several rumours have come out on the subject of alien-Earth exchange programmes like Project Serpo and the testimony of Dan Burisch. Do these names refer to human astronauts who are visiting other planets, or maybe aliens visiting Earth!? Take your pick! Gary didn’t really think he was doing anything seriously wrong, but a few months later the police burst into his home and arrested him. He was told he was being charged with some minor misdemeanors like cyber-trespassing and damage to computer systems. He was told to expect six months community service. This was then later extended to extradition to the USA and… sixty years in jail! It sounds like someone is scared of what he did and what he found out and wants to shut him up. Either that or they want to make an example of him, to warn the rest of us off. At the moment he is fighting extradition and his case is due to be heard in June by the House of Lords. I think this proves that whatever he saw it is real. He is not making it up! UFO’s are a reality and the governments are vigorously suppressing it. Otherwise why would they come down so hard on him? If he’d murdered an American citizen on holiday in Florida he’d be in less trouble than he is now! Gary is very adamant that meant no harm. He wanted to look for information on UFO's and Free Energy because he, like me, believes that the world needs to know about it. We've got pollution and oil wars, old folk freezing to death in their homes every winter because they can't afford their domestic fuel bills, when technology exists that makes all fossil fuel-powered systems totally obsolete and could provide unlimited energy to everyone on Earth for no money at all. It's an insane state of affairs! http://www.defenselink.mil/ and searched for any pages under the tags of “UFO” and “non-Terrestrial officers”, but came up with nothing on “UFO" at all (which even the British MoD is tackling, see below) and nothing on “non-Terrestrial officers” except a vague PDF paragraph relating to communications satellites over Kosovo. I imagine that Gary’s exploits have taught them a lesson and they’ve tightened up security. Instead of punishing him maybe they should have instead offered him a job! He could be employed to kick their incompetent website team into shape! It would be the ultimate in using a thief to catch a thief! 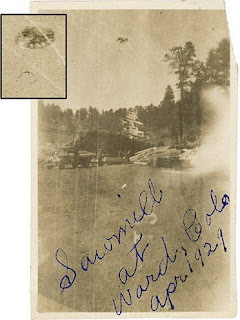 These photographs of UFO’s were all taken before 1940. 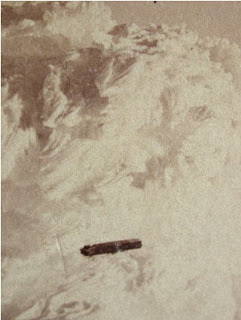 They include the oldest known UFO photo, from 1870, the one second from the top, of a cigar-shaped object. So much for UFO’s being a purely modern phenomenon! 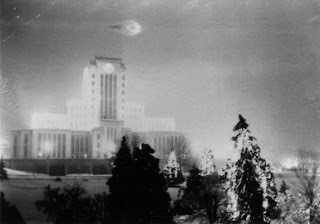 I keep hearing all the time that UFO’s are a myth caused by hysteria born out of the rising profile of science fiction movies in the post-war era. Well as you can see this is not the case at all. It’s true that the number of UFO sightings has increased many-fold since the 1940’s. This could be partly because of the above-stated reason, but also that decade saw the advent of both nuclear weapons and space rocket technology. If there were folks out there then such a development might concern them: a planet has produced a species that was about to begin traveling beyond their home planet, but still had aggressive and acquisitive habits. That would bother me! As Jim Marrs said: “The rest of the universe looked our way and cried out: ‘Oh my God! The kids have found the matches!’.” It’s also been said that nuclear fission reactions and explosions damage the fabric of space-time, creating holes between dimensions that let the UFO’s through. And there’s no doubt that UFO sightings are concentrated around nuclear facilities, like the “Solway Firth Spaceman” (see the article below). 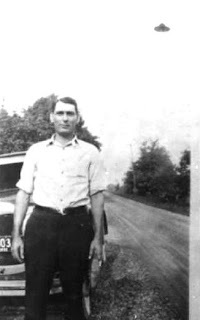 I myself have a UFO photo somewhere at my dad’s house. I took it on Polaroid near another nuclear facility, the Trident submarine base of Faslane on the Firth of Clyde in Scotland, but I didn’t see the UFO until after it had been developed. I’ll try to find it. 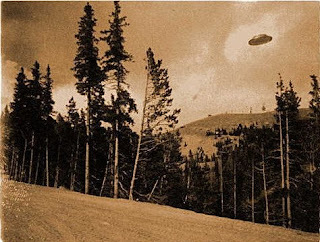 Despite this, as these pictures show, UFO’s were present in the world before they entered popular culture. Who knows when they first began; maybe they’ve always been with us. But people have been reporting them before the 1940’s. They’ve actually been reporting them for as long as they can do so without being locked in a lunatic asylum or burned at the stake for witchcraft! I’ve just begun the first HPANWO investigation into a suspected paranormal incident! I’ve been reading about other people’s investigation into these incidents, but this is the first time I’ve initiated one myself. And I haven’t traveled to some dark burial mound in the depths of the West Country or a clearing in a wood in Idaho. No, the phenomenon has taken place literally two hundred yards from my front door! 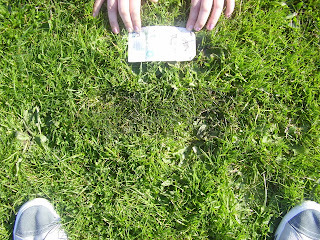 Description of Phenomenon: I was playing with my 13-year-old daughter in a park in Cowley, Oxford when I noticed a row of footprints across the grass (Top and second photo. The park can be seen on Google Earth in the south-east of the city in the corner made by the by-pass and Barns Road crossing at the bridge into Blackbird Leys). This struck me as most unusual; neither of us had ever seen anything like this before. Our feet do leave a small impression when walking across grass, but this mark is almost invisible and the grass recovers quickly. People walking can only effect grass over a long period of repeated use, like you get big long ruts acorss fields where people regularly traverse. As you can see in the photos, these footprints are very prominent and didn’t fade at all during the 45 minutes we were there. 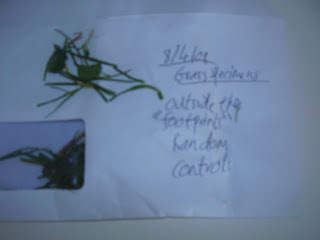 The spoors were of feet approximately size 10 with a stride slightly shorter than my own. This would indicate a person (if it was a person who made them!) a little bit smaller than myself. I am on the large side at 6’2, 18 stone and have size 12 feet, so the prints could be those of an average male adult or a bigger-than-average female; although as I learned during my brief affair with the Sea Scouts, the prints do not point obviously inwards as a woman's footprints do. The prints are in the bare grass; there is no other medium around to cause them, sand, gravel, frost, snow etc. How they were made is not possible to determine without laboratory analysis, but it seemed to me that the grass inside the prints is of a different consistency and quality to the grass outside it. 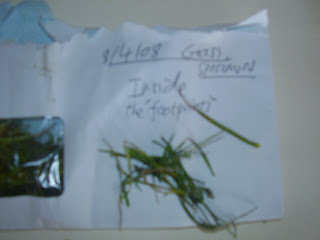 I have taken specimens of the grass and soil, plus a control specimen from a short distance away. I’ve taken a photo of a single spoor, with a £5 note beside it for scale (Third photo), and it’s hard to discern from above, but as you can see, the prints are very clear from some distance away. I’ve discovered two rows so far. One runs is a straight line between two broken gaps in the fence. The gap on the west side of the park is at the back of a garden, as you can see in the fourth photo. 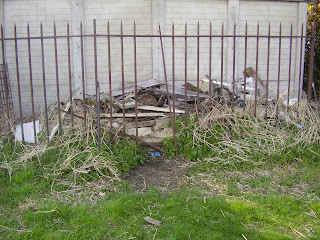 Immediately inside the gap is the side of a garage or shed; there is no access from the space behind the gap to the rest of the garden as it is blocked by thick vegetation. If it was then it would provide easy access for burglars and presumably the householders would be concerned for their security. The row is dead straight and leads to the second gap in the fence behind a terrace of shops on Barns Road (fourth photo). There is a second row that runs from a gate in the south-west border of the park. 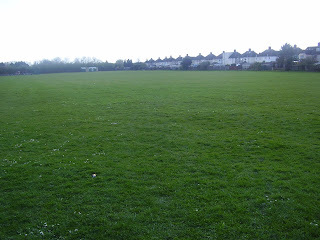 This row meanders in arcs and dog-legs, and vanishes in the centre of the park where the grass gets thin on the football pitch. We picked them up again near the eastern border of the park and they run up to the tarmac cycle-path of the bypass. The prints look identical to the first set. Theories: If these are human prints then how could they have been formed? 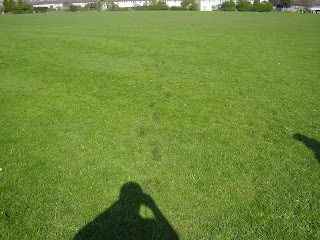 As I said above, a single person walking over grass does not damage it and normally leaves no trace at all. We had a thick snowfall on Saturday night and I did wonder if the packed snow and ice under someone’s feet might have caused injury to the grass, but then if this was the case there would be many more rows of prints. This park is a 24/7 thoroughfare and is used for sports, recreation and dog-walking etc. During snowfall it would be thronging with children making snowmen and having snowballs-fights etc. The whole field would be speckled with similar spoors. I’ve never seen prints in the grass like this before, but you can bet I’ll be looking out for them now. Could it be a genuine paranormal occurrence? Many incidents in which ghosts, aliens or otherworldly entities appear leave traces in the surrounds: higher radiation levels, apparent heat and dryness damage, mysterious residue etc. Maybe this is one of them. I don’t have the money or skills to carry out a proper scientific investigation, but I have the specimens if anyone HPANWO readers want to help out. One thing I’ve mentioned on the David Icke forum that I haven’t here: I saw an object in the sky on Saturday night that might have been a UFO. Could there be a link? Another clue is in animal behavior. Animals often behave strangly in places where mysterious phenomena appear, dogs growl, cats hiss, birds refuse to fly over the area etc. I noticed nothing like that in the park; in fact a Dachshund was frollicking quite happily nearby while we were taking the photographs. Next Stage: The next stage of the investigation is to go back today and see if the prints are still there. 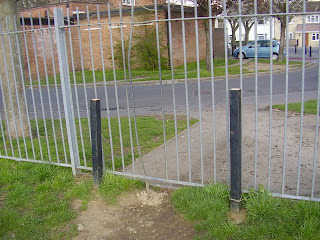 I should also visit the house with the gap in the fence and ask the people there if they’ve noticed anything strange. I’ll keep you up to date with any developments. Many thanks to my daughter Louisa for helping me with this project. They trample on the graves of the thousands who died to indulge in their wacky fantasies. I'm glad they told me that that. I'm sorry. I will try to be more sensitive in future. I will try to show genuine respect for the victims. The other day I saw an old lady getting kicked to death in the street by a gang of thugs. The thugs then took the handbag from her dead bloodsoaked hands. I was going to shout for help and call the police, but then I remembered: If I do that I'm a heartless exploiter. So I kept quiet and didn't tell anyone. I'm glad I've shown respect for the poor woman's memory. Can we show respect for the 9/11 victims in the same way? Can we keep quiet and not call for help? Can we let the thugs who did it get away with it? Or are we going to shout out, call for help, be heartless exploiters? According to this article: http://news.bbc.co.uk/1/hi/business/6384583.stm the new £20 note has "new security features". Well wasn't the watermark and silver thread designed to make banknotes unforgeable? There are RFID technologies capable of being contained within this thread. It could be used to monitor what you buy with the note. It could trace you from when you take it out of the bank to the shops and which till you go to and the product that you buy. So much for the privacy of cash! This kind of thing is a back door to the cashless society. Someone said to me "It's not RFID, it's just a holographic strip." Well a holographic strip is a step towards RFID, even if it doesn't yet contain the chip itself, because it's making banknotes look, feel and function more like bank cards; and that’s how the public will perceive them. All modern credit and debit cards have a holographic image on them to make fraud harder. 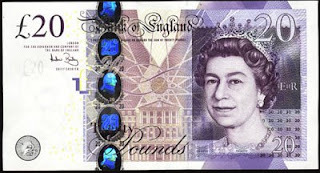 We all know how much the Loomies love putting their symbols on banknotes! Most HPANWO readers will be familiar with the Illuminati pyramid on the Dollar Bill. But that's just one of many instances of hidden messages in money. Along with the silver strip, there are some other intriguing and sinister elements to the new £20 note. There’s a compass rose or sun-disk, a symbol that seems to appear everywhere these days (see my article on symbolism in Oxford). It’s presence on the £20 note could be a coincidence if it didn’t also appear on the New Zealand $5 note. Wise Woman, author of the Too Long in This Place blog (see links) has discovered that the number 88 can be seen on it too; this links in to Sir Edmund Hillary, the face on that same note. 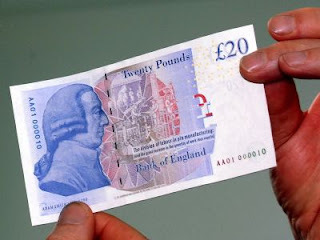 Look at the reverse of the £20. The first thing which strikes me is that the traditional British “£” symbol has been changed to a very bland, modern and parochial looking motif. It is inverted which is very Satanic; it also resembles the Euro “E” symbol quite closely. This could be a hint at what is to come: the end of British pounds and pence altogether and the adoption of the single European currency. There’s more than that on the reverse that concerns me. You'll see that Edward Elgar has been replaced by a profile Adam Smith, the Scottish economist whose words have been twisted to justify globalization. Those north of the border are over the moon because he’s the first Scotsman to appear on an English banknote, but maybe if they understood the deeper meaning in the imagery they’d think again. The face of Smith has the caption: "The division of labour in pin manufacture". What a strange thing to put on a banknote. Nothing about Rutherford splitting the atom or de Haviland breaking the sound barrier or many of the other feats British people have achieved... no we've got to celebrate our pins! Then again, if you understand subliminal perception then there's a very good reason for the new £20 note having a reference to pins on it, seeing as it already had a credit card style hologram: change "pin" into "PIN" Personal Identification Number. This is another hint of what they've probably got in store for us: banknotes becoming bank cards which you'll need a PIN to use! There are several countries already making plastic banknotes, including Australia. Australian dollar notes are longer lasting and don't go all mushy if you accidentally leave them in your pocket when you put them in the laundry; so much better! But, as I said above, it's important to see the hidden agenda and ask yourself if the benefits are worth the price. The liberty of being allowed to have access to your own money has been sacrificed before. In the 19th Century many mineworkers were not paid any money, they were given "truck tokens" which could only be spent in special mines shops. It makes a joke of the idea that slavery was abolished 200 years ago! What is the difference between this and slavery!? In Roman times and in many other ancient societies where slavery was accepted and commonplace they had a similar system. A slave was considered the property of their master and received no wages; however a slave-owner had to provide food and accommodation etc for his slave. This would mean a lot of organizational work, shopping paying bills etc, so some just used to save themselves the bother by giving the slave tokens and saying "Go and get whatever you need." The slave could then take the tokens to special warehouses and exchange them for goods of their choice. What's the difference between that and the truck system? If we accept a cashless society or even one where our cash is monitored, then we introduce a global truck system. Without cash we no longer choose what we do with our own money, because we have no control over it; and the government alone will choose what we buy, when and where we buy it and even if we buy anything at all. A lot of people pay with plastic today, and occasionally the machine at the till will refuse to accept your card. This is not a problem nowadays because we still have the option of paying with cash. What do we do when there is no cash? There’s nothing we can do! The system has complete control over all our financial activity. In the novel Better Than Life, a book based on the hilarious Sci-fi comedy series Red Dwarf, Rimmer punishes a man by taking out a court order that stops him from buying Heinz baked beans; instead he has to put up with inferior supermarket brands! This may sound funny, but many a true word is spoken in jest. In the cashless society just such a punishment will become possible. And if the authorities ever get really pissed off with you then all they have to do is turn off your card. What would you do then? Nothing! Unable to buy anything at all, including food, you’d quickly starve to death. This is the kind of world we will live in unless we reject the cashless society. I mentioned Dr Jill Bolte Taylor in my Probe Conference report, because Jeff Moran showed us a clip of her address at the TED Talks. She is a neuroanatomist specializing in neurodisorders like Schizophrenia and bipolar who, in 1996 at the age of thirty-seven, suddenly suffered a massive stroke. Her mental functions deteriorated to nothing over a period of a few hours, eventually leaving her in a profound vegetative state: totally aphasic, paralyzed and amnesiac, like a new-born baby trapped in the body of an adult. But she survived and came through it to tell the tale. It took her eight years to fully recover, but she’s still changed enormously. In a way, she considers herself fortunate! She’s one of the few neurologists who has been able to study brain damage through her own injury, rather than another person’s. Her stroke, as devastating as it was, has given her a whole new insight; not only into her science, but into the nature of consciousness and being itself! Well, I’m back; and as usual I’m in the throes of “post-Probe blues”. My fourth Probe conference is over and another six months without my beloved Probe-buddies looms ahead. But it was worth it and I’d never have missed it for the world! I salute Jean, Sam and all other organizers who made the experience possible; thanks guys! This conference was as fun and interesting as any, but it was the most arduous by far. There were ten speakers instead of the usual eight which packed even more into the weekend than the previous events, which are as intense enough as it is. This of course gave the delegates more information and therefore better value-for-money, but the speakers had a shorter time on stage and the breaks between sets were shorter too. The inevitable lapsing of the schedule was consequently more serious and I felt a very manifest urgency to the proceedings. I prefer the 8-speaker format personally. But nevertheless it was fascinating and wondrous and I’m dosed up to the gills with unprocessed information, pushing and shoving in the queue for my back-burner. I feel like a computer that’s just downloaded a huge package of programs, but hasn’t installed them yet. The installation process will take a long time and may not even be complete by the time of the next Probe in October. I arrived on Friday lunchtime after a train journey through the pouring rain. In fact the weather this weekend has been generally a wash-out and I’ve been soaked quite badly! But as I got off the train the clouds parted and the sun shone. It felt like a greeting and so I walked the long way to the hotel and took a stroll on the beach (I even saw the object that Nathan Sorea found! See below). The freezing wind ripped through me and the sun blazed its energy into me. Later on my friends Fred and Val turned up and we went out for a meal together that was lovely. This conference was rather disappointing in some ways because so many familiar faces that I’d looked forward to seeing were absent. Ellis Taylor is still in Australia after the Laughlin UFO conference, Dave Starbuck is trapped by responsibilities at home and Ben Fairhall has become a bit of a recluse lately. In fact I got talking to someone who had intended to travel with him and she told me that she couldn’t get in touch with Ben and so had to travel to the conference alone. His blog is on private access only and when I emailed him asking for an invitation I found that his email had changed. I wonder what he’s up to; maybe some explosive discoveries he’s made. Hope he goes public with them soon if they’re that top-level! Despite all the absent friends, many of my good old mates did show up: Matt Delooze, Suzy- who's married to Matt, Dennis and Marian, who had a great stall this time, Fred and Val Allsop, Tony and many others whom it was great to see. I was delighted to find many HPANWO fans there who were pleased to meet me when they realized that I was the author! My mate Tony ran a counter on the blog a few months back and I’m getting lots of hits; it came to over 3800. Many people are linking up to HPANWO now so that’s great. But I think that's a good thing because I just want to get my message across. I don't want to be famous; in fact the whole basis of my philospohy is that we don't need fame and fortune to be OK people. As I said, it was uplifting to see all my old mates again, but I met some new people too. I got talking to a young lady called Kerstin who runs a blog of her own called Marmite-Lover; I also met a bloke called Dave whom I had a nice chat with. So many people were there for the first time, including a lady who’d just celebrated her 92nd birthday! Hope she enjoyed it. I didn’t have much money this time unfortunately, what with all the other expenses (and indulgences!) I’ve entertained lately. I had to make some difficult choices from the array of books, movies and other merchandise there. In the end I bought two books including one I’ve been meaning to get for ages: The Day after Roswell by Colonel Philip Corso, the outspoken former Pentagon official who’s revealed a lot about secret governmental UFO policy. I also got an old Tim Good book to add to my collection: his 1991 Alien Liaison. I bought a DVD on Area 51 and an alien T-shirt from Dennis and Marian’s stall. I experienced many hardships at this Probe, and I’m not just talking about the weather. I’ve already mentioned the many new friends I made over the weekend, but at the same time several existing relationships are now in jeopardy. I’m learning that although the vast majority of Probe regulars are wonderful people whom it’s a joy to be with, there are a few individuals I need to avoid. At Probe we spend hours and hours out of the arena discussing and chatting, and this is one of the greatest joys of the conference. We have many diverging views. I’ve never had a problem with anyone who has a different view to mine, no matter how extreme. The feeling is usually mutual, but there are some people who get a bit hot under the collar in that situation; they sometimes even become aggressive and start hitting me with personal insults. This then gets me angry too and an argument follows. I was told by someone at the last conference that I was ”living in Cuckooland”! At this conference the same person said that the only reason I didn’t think the same way they did was because I obviously hadn’t suffered as much! This was unprovoked, improper and just plain wrong, but I kept plugging away, trying not to bite back in the same way and sticking to the issues not people. But then this person shouted at me, in a loud voice and in front of other people, that they, in a hypothetical situation, would not risk introducing me to their mentally-handicapped relative because my manner might harm them! This is probably not true seeing as I have to deal with mentally-injured people every day as part of my job, but even if it was true, it’s really spiteful of that person to exploit their relative’s situation like that, especially using it as a weapon to attack me. I felt deeply embarrassed and hurt. Hopefully by the time the next conference comes along this person will understand that and refrain from addressing me in such a way again; if not then the two of us will have no further contact. I also have a sore misgiving with the conference’s accommodation. The last two times, the speakers have all been put up in the Carlton Hotel and the place serves as a social centre for the delegates, both resident and visiting. But the bar is very small and has no draught beverages. Also the barmaid there is less than totally helpful and accommodating! On the Saturday evening I turned up with a new friend Kerstin that I’d met at the conference. We’d just been in the Admiral pub and Kerstin wanted some fish and chips. I assumed that she’d be allowed to eat them in the hotel, seeing as they were not serving their own food at the time; most other hotels I’ve been in are fine with it. Unfortunately the barmaid kicked her out. I pointed out that it was chucking it down with rain and asked the barnmaid if she could make an exception just this once, but she point-blank refused and turned her back on us. Kerstin was understandably very upset and went back to her hotel, so missing out on what should have been a delightful few hours. I hope the conference finds somewhere else next time. I much preferred the Elsinghurst Hotel where we were before. Since Thursday night I’ve also been experiencing something untypical and unwelcome: Nightmares. Normally nearly all my dreams are either pleasant or neutral, but the last five nights I’ve had sad and/or frightening ones. I originally put it down to anxiety about being away from my daughter, and indeed the first one, the night before leaving, was about her. But they’ve carried on since. They mostly involve my mother, who, as regular HPANWO-readers will know, died in November 2006. In fact, I’ve started to wonder if she’s trying to haunt me! I know it sounds silly and probably subsequent events will disprove it, but I can’t get the idea out of my mind. I’ve been feeling very ill since I got back; Along with my post-Probe blues I’ve caught a cold and feel fluey. I always get a cold when I get upset or stressed out and I predicted getting it beforehand. Hope it goes away soon because I go back to work on Wednesday. At the conference I had hoped to get a bit of skywatching in, after all it’s exactly a year since my first UFO sighting on St Annes beach. Unfortunately the weather was so atrocious that I didn’t bother trying. This could have been a mistake because another lady at the conference told me that she and her two mates had seen a UFO right over the street where our hotel was, during a brief let-up in the overcast. It consisted of a series of lights in the sky “brighter than the stars” that moved in a “figure 8” formation. I wish I’d been there to see it! Dr Merryfield was the stand-in speaker to replace the film producer and researcher Chris Everard who’s apparently stuck in France because he can’t get his new passport processed (Seeing as he’s been making a movie about the murder of Princes Diana that’s hardly surprising!). Merryfield was a big, lively man with a thick white beard. He’s a great friend of the comedian and actor Ken Campbell and began by telling us a bit about him. Campbell produced the stage play adapted from my favourite book The Illuminatus! Trilogy, which must have been a task and a half because it would be a hard novel to adapt. He was also drawn into the world of the Cathars, getting his inspiration from the novel Flicker by Theodore Roszak. The main part of his address was about Damanhur, an alternative spiritual community in the mountains of Piedmont in northern Italy. The community is centred around a series of caves and grottoes that were constructed in total secrecy between 1978 and 1992. The complex has been described as an “art gallery”, but that hardly does it credit. It is one of the most beautiful things I’ve ever seen. The caves are perfectly-shaped underground temples covered on the walls, ceiling and floors by exquisite murals like nothing I’ve ever seen before. There are no words to describe it. Have a look on their website: http://www.thetemples.org/ The authorities originally wanted to destroy it because it was built without planning permission, but more likely the Church put them under pressure, fearing a rival to its monopoly on our souls. Thankfully they failed and the centre is open to visitors in a similar way to the Findhorn Community in Scotland. 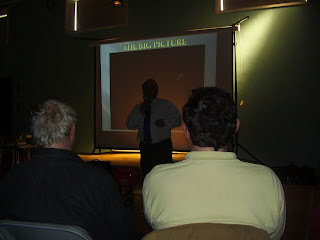 David CaytonDavid Cayton’s interest in the paranormal began when he was in the Royal Air Force and had to deal with UFO’s that regularly appear on radar screens (A friend of mine at the conference who was also in the RAF said that he’d heard of UFO’s on radar as well). Later on he became a researcher into one of the darkest and most disturbing strange phenomenon of all: animal mutilation. Reports on animal mutilations or “mutes” began in the 1950’s, but were only taken seriously in the 70’s by the renowned UFOlogist Linda Moulton-Howe. Domesticated animals are always being killed by predators, accidents or human attacks, but occasionally a dead animal will turn up with injuries that don’t fit the format of conventional deaths. Parts of their body will be surgically removed with medical skill and precision. The wounds often don’t bleed or the entire body will be exsanguinated, have its blood completely drained, as if by a vampire of some sort. Often the body will have a strange chemical smell or be covered with an unknown residue. It might decompose unusually quickly, or conversely lie preserved in a kind of mummified state. In either event, hungry scavengers leave it well alone which is strange behavior for them. Farm animals are most usually the victims, but occasionally pets and even wild animals are effected. David went on to describe his investigations. He seems to have won the trust of the farming community and they often call him now before they call the other authorities. This has not gone unnoticed it seems. He one day received an angry phone call from someone at DEPRA, formerly the Ministry of Agriculture Fisheries and Food, warning him not to get involved. The government appears to be aware of what is going on and are clearly worried about it, but true to form, don’t want publicity. Either they know why this is happening and want to keep it secret or don’t know and want to prevent public concern. David’s address was interesting and it told a story that needs to be told, but I think he could have made his point while leaving out some of the most gruesome pictures. After 18 years in the Hospital Portering Service I’ve developed a stomach about as strong as one can get, but when he put up a picture of a cat cut in half I had to look away. Many other delegates were profoundly upset by it. Most frightening of all, the species who suffer these kinds of attacks are so varied that they occasionally include Homo Sapiens. He showed evidence of an incident where 12 human bodies were found in a forest with the typical injuries of these anomalous mutilations. Because of the tight schedule at this conference there was little time for Q-and-A sessions, but if there had been I would have asked two obvious questions to which David didn’t pose an opinion: Who… or what… is doing this? And why? I’ve heard several theories: Satanic ritual, black-budget government operations, aliens collecting scientific specimens; but none of them fit the evidence. The persons… or other things… doing this are working from a motive beyond our ability to even speculate. Matthew DeloozeI’ve known Matt for a long time as he’s always attended the conference, but this is the first time he’s been a speaker. He gave a very interesting and stylish address which was rushed more than any of the others and sadly cut short by the schedule. 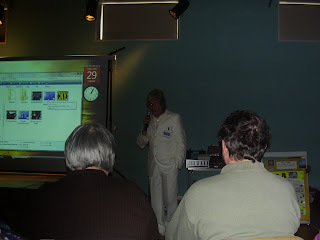 He came onto the stage dressed in a white suit and straw hat. He got straight to the point with the simple words: “The human race in under hypnosis!” He explained how we are programmed to feed and worship a force from another dimension. He went on to explain how sometimes we carry out rituals of homage and sacrifice without even knowing it, through outwardly harmless activites. He calls the regime of this malevolent extradimensional intelligence “The Serpent Cult”. Matt was living an ordinary, conventional life in the north of England, unknowingly serving this cult, until an awakening experience at the age of 40. He was a working in an aviation factory, under the supervision of a foreman who bullied him. It drove him to the brink of suicide, but then he had what sounds like a powerful transcendental revolution. It led him to write books and an excellent website that you can find on the links column. He’s working hard to understand how the Serpent Cult works and how it generates energy from us. He spots symbolism and actions in conventional society that are really hidden opus of the Cult. This is something other researchers have dabbled with, including myself and David Icke with his theories on the “secret language” for instance, but Matt has gone into the subject deeper and in more detail than anyone else and his work will make you look at the world very differently. He has two books out, but he also writes long articles online. He wrote one about Ferris wheels a few months ago and what they mean. This tied in with the spectacular and bizarre New Year celebrations in London with an arsenal of fireworks watched by an enraptured crowd in front of the world’s biggest Ferris wheel, the London Eye. This is one of the biggest white elephants in the city that loses £50 million a year, but it is kept open. Why? Jeff MoranJeff Moran was someone I think I’ve seen before at Probe. 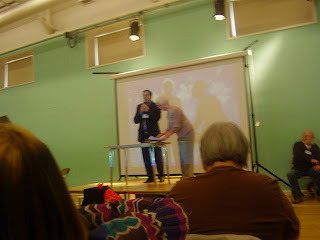 He gave a speech that involved audience participation that demonstrated how our brains work. He does a lot of this at schools, although he obviously has to tone it down a bit to get through the door! He showed some short movies that included the cartoon character Bartok listing all the different organs in the brain. He also showed a clip from something I’ve been meaning to get into for months: the lecture by the neurologist Dr Jill Bolte Taylor, a woman who suffered a stroke and was therefore able to study her own brain from its personal injuries; she’s come to some startling conclusions. Jeff’s speech was hard to follow because like many Probe speeches it contained so many concepts, and it wasn’t helped by the fact that I missed the beginning of it because I was having dinner, but one image I recall very well is another short movie showing a person being treated for cancer by sonic transmissions in China. The camera shows the monitor of an ultrasound scanner and you can see the tumour shrivel under the resonant voice of the chanting practitioner. 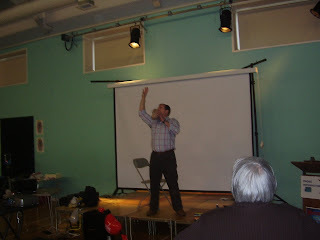 Jeff showed us the power of sound by blowing a horn made from a seashell that we could feel in our whole bodies. Neil HagueThis is a man whose work I’m very familiar with, and again you can get to his site from the links column. I’ve read both his books and they are damn good. But it’s his artwork that really drew me to him. He’s since become my favourite artist. His pictures are colourful, detailed and have a kind of abstract Shamanic quality that can rivet me for hours. It reminds me of the paintings of Damanhur actually. I went to one of his exhibitions in London in 2004 and got the chance to meet him. It was well worth the journey. Neil is also a very good friend of David Icke and took the piss out of him a bit (Oops, he asked us not to tell anyone that bit!) He’s also, like Ellis Taylor, a nature-watcher and notices things like birds’ flying formations and patterns in trees. He’s a big fan of William Blake who was, and still is, a very controversial artist and writer, 200 years after his birth. Blake also adapted things in nature, like the shapes of trees and rocks, into his own artwork. Skeptics call it “just your mind playing tricks!”, but for Shamanic minds, it’s a whole way of seeing the world. The basis of his message is that life is a holographic creation. It is made up of matrix of templates that get repeated over and over, like the spiral: It can be a swirl of cream in a coffee cup, a hurricane, or a spiral galaxy. The scale is different, but they’re made from the very same basic shape. The same goes for the way the pattern of veins on a leaf resembles a river delta seem from very high up. Children are good at spotting these connections, but as we develop and mature in the quantitative, fragmented mindset of Western cognition we lose that ability. From what we see of ancient art, from the Classical and Egyptian to the even older cave paintings; this mindset is a new one and foreign to the natural human state; this tied in nicely with Jeff Moran’s view on the workings of the brain. Nigel was the first of the Sunday speakers. He was probably the hardest of all to follow, not because of any lack of skill on his part, but because there was just too much involved in his discoveries for me to comprehend in a one-hour introduction. Nigel’s research centres around Ilkley Moor in Yorkshire, a vast wasteland of pasture, woods and heath with a spooky and occult reputation. The famous song On Ilkley Moor Baht At means “on Ilkley Moor without a hat” in the native Yorkshire dialect (Hardly spoken today sadly), and I wondered if there might be a connection with UFO’s because before sci-fi became popular, people often used the simile of comparing classic saucer UFO’s to hats. Nigel also got reports of people seeing etheric swords. These objects would appear like orbs, suspended in the air, and are still seen today. Witnesses report that although they’re very obviously swords in shape and look, they do not seem to be made of inanimate metal, but are described as “alive”. He began looking into the phenomenon and discovered that there is a legend of a golden sword appearing at a church in one of the towns bordering the moor. That church today has a replica of the sword on display inside it. Nigel’s investigation led him to discover a new megalithic site and a link with a Viking warrior called Harkon the Good. I didn’t quite keep up with the connection, but the Vikings called Ilkely Moor “The Land of the Dragon”. He is convinced that there are other ancient sites waiting to be discovered and it’s a good reminder that we don’t have to travel to the depths of the darkest jungles on the other side of the world to find the unknown; there are mysteries and wild frontiers right on our doorstep. Nathan SoreaNathan Sorea is a spiritual healer. He’s also a motivational lecturer into positive thought. We hear a lot about this kind of “life coaching” these days and it’s mostly false, gimmicky rubbish, but some of it is based on genuine spiritual principles. He, like me, is an avid fan of the film What the BLEEP Do We Know? This fabulous movie was made in 2005 and tells the story of a woman, played by Marlee Matlin, who explores the world of scientific spirituality and learns to bring joy and peace into her own life. The drama is interspersed with commentary by leading physicists, theologians and spiritual researchers like Mical Ledwith, Fred Alan Wolf, Lynne McTaggart (Extended edition) and Joe Dispenza. Nathan compares the film to its wider-known pale imitator, The Secret. Like me, Nathan finds The Secret not half as good as WTB. He also sees it as a commercialization and debasement of spirituality. I think that’s a bit too harsh, but I know where he’s coming from. The Secret is an attempt to take the genuine positive thinking movement and merge it with the tacky life-coaching industry. This train of thought lead Nathan onto the pathological generation of consumer culture that The Secret panders to and has devastated the world, causing ill health both for people and the planet. He mentions the manipulation of the public mind by the likes of Edward L Bernays who virtually invented the modern marketing industry. Nathan then got the audience up on our feet like Jeff Moran did and gave us a series of exercises to mentally detox and enliven us, and it worked I can tell you! He got us to recite an anti-fear oath; and he says that the word fear could be an acronym for "False Expectations Appearing Real". He also points out positive omens like how he found an object on St Annes beach that could be part of a black helicopter! 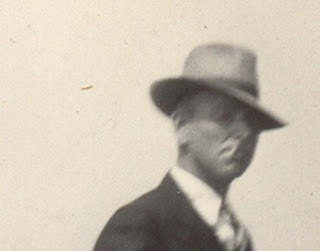 Richard LawrenceRichard Lawrence is a member of an unusual group called the Atherius Society. It’s a quasi-religious organization that believes in UFO’s and sees their presence as the next step on human spiritual evolution. It believes that the great spiritual masters of mankind like Jesus, the Buddha, LaoTzu etc, were all in contact with spiritually enlightened ET’s. His speech began with some very sensible and down-to-Earth statements about the UFO cover-up and how it is today failing, but then went onto a path that looked very unhealthy to me. He seemed to regard the ET’s in a similar way to how many people in India worship guru’s and Holy men simply because they’ve spent ten years on a mountain top eating nothing but dry rice. It’s a kind of extension of the New Age or Oriental guru cults to encompass aliens; Sai Baba with bug eyes! It is simply not my line at all, especially coming so soon after David Cayton’s speech on cattle mutilations. I’m not going to sign up for the Atherius Society (Although they sound slightly less phony that the Raelians! )But Richard is partly right. 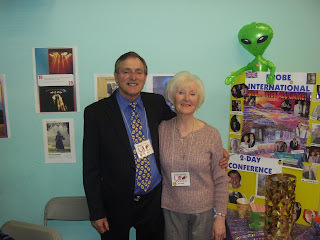 There are people who’ve had very enlightening and uplifting experiences with aliens. Read Stephen Greer’s new book for an example. But there are people who’ve had encounters with aliens that are terrifying and agonizing and have even led to nervous breakdowns and physical disability; some encounters prove fatal. Richard explains this away in the same way Greer does: All unpleasant encounters with aliens are staged by the government to generate fear of ET’s. As I’ve written before on HPANWO, this explanation might fit in a few cases, but falls woefully short of covering the whole issue. I think aliens are just like us: some are caring and benevolent, while some are exploitative and wish us harm. They should be loved and respected by us as fellow universal lifeforms, but they are not Gods, demigods, Messiahs or anything that should be worshiped and venerated. David BoyleDavid Boyle runs a conspiracy exhibition in nearby Blackpool that I’d hoped to visit on Friday afternoon after arriving on the train, but found that it is unfortunately closed on weekdays. I first heard about David in the book by the cryptozoologist Jonathan Downes: Monster of the Mere. In 2002, Downes and his colleagues visited David’s centre to learn more about local folklore. Downes has little time for “conspiracy nuts” (like me! ), but warmed to David because he saw him as the only person in Blackpool not out to exploit the tourists with tacky gifts and sweets! David is a stocky, elderly man who comes across as very jolly and lively. He reminds me a bit of the late actor and comedian that I love, Roy Kinnear. He gave a rich lecture on a huge variety of topics and at the end said: “That’s only about 2% of what I have to tell you!” His address included visuals and movies. I’m glad to have met him because he, like me, is a fan of the book Two Thirds which is not well-known, even within the “scene”. David is more of a “presenter” of other people’s work than a researcher in his own right. Some people dislike this and consider it immoral, but I think that so long as you credit and source what you present, which David does, then there’s no problem. I think there’s even a legitimate role for an eloquent public-speaker to present other people’s discoveries. He seems to have a good relationship with Two Thirds’ author David Percy and I hope Percy is glad to have someone like David Boyle giving him all this free publicity. In fact why doesn’t Boyle charge him a fee! ?